The time has come for Chicago’s elite Halloween festival to hit us with their best, and the people of Chicago are ready. 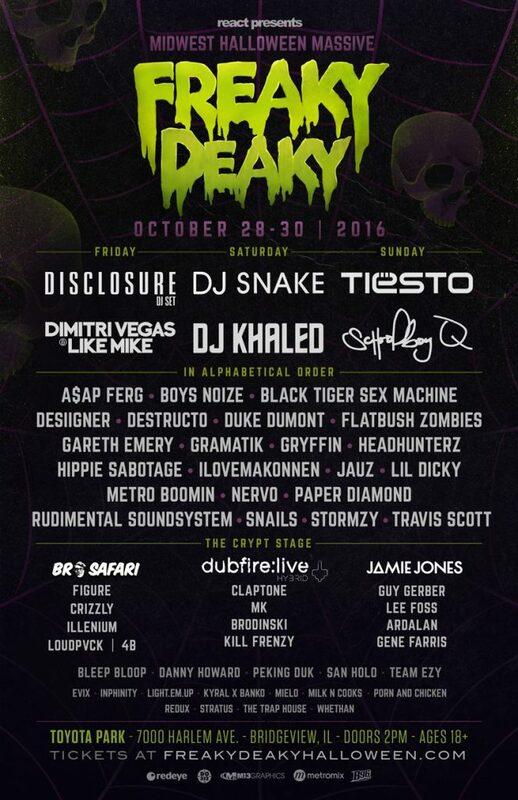 Freaky Deaky’s star-studded line up has kept us anxious for this weekend for so long and it is right around the corner. It seems to be that the first time Freaky Deaky was held at Toyota Park went so smoothly that they are coming back to the same venue for a second year. I personally enjoyed the atmosphere last year, it was refreshing to see Freaky Deaky go from an indoor festival to a full blown 3-day outdoor festival. Each day packs a punch of its own. Friday has British duo Disclosure, chart-toppers Dimitri Vegas & Like Mike, and well-known Travis Scott. Some key acts also include Destructo, Flatbush Zombies, and a special Rudimental Soundsystem set. The Crypt stage is in for a heavy bass-filled night once Bro Safari, Figure, Crizzly and more take over. Saturday follows a similar route with DJ Snake and DJ Khaled taking over the mainstage. A$AP Ferg, ILoveMakonnen, and Metro Boomin will woo the rap lovers earlier in the day. Meanwhile, the Crypt stage takes a turn on the house and techno side with a special Dubfire: Live Hybrid performance, Marc Kinchen, Brodinski, and crew. Following those two days of music, Sunday ends with veteran Tiesto and LA’s very own ScHoolboy Q. International superstars Boys Noize and Duke Dumont top off some of the festivities earlier in the day, with the help of Shark Squad leader Jauz as well. Jamie Jones, Guy Gerber, Lee Foss, and company finish off the weekend at their own stage. All in all, you can’t ask for a more diverse lineup taking place over Halloween weekend. React took it upon themselves to break away from the typical EDM lineup and throw lots of rap and house into the mix, which is a plus in my books. After parties have gotten released as well, with Disclosure, Tiesto, Snails, Jamie Jones b2b Lee Foss, leading the pack of a packed weekend. If you haven’t gotten your tickets yet then it is not too late, check out their site for more info on tickets.